For a about the 40th time, I watched my favorite classic movie "Gone With the Wind" last night. Well, let's say, I watched most of it. It's a long movie and though I've seen it in its entirety, I've never sat though the whole thing in one sitting. I've seen it so many times I have many of the key lines memorized and can anticipate them, but with every viewing I still notice something new. For those unfamiliar with the story, "Gone With the Wind" is a historical fiction novel written in 1939 by Margaret Mitchell. It's the story of the O'Hara family who were American cotton plantation owners during the 1800's in Georgia. It especially focuses on the family's beautiful, fiery, and cunning daughter, Scarlett and her unrequited love for the southern gentleman Ashley Wilkes, who by family tradition has married his sweet, saintly, and mild-mannered cousin, Melanie Hamilton. The story plays out against the backdrop of the American South. It opens with a written, over-romanticized soliloquy about the grand and "gallant" civilization of slave-holding plantation owners, calling them "knights and ladies." There are scenes of "darkies" peacefully working the fields, with no cruel overseer or bullwhips in sight. For some reason I never before realized how stereotypically the film portrays the black slaves owned by the O'Hara family. They are for the most part portayed as dull, dimwitted, overgrown children who need the guidance and protection of their white, more intelligent owners. Their dullness is emphasized by repeated scenes of them stupidly chasing around chickens, sometimes in the rain. The only one who seems to have any sense at all is Mammy, the head house slave. Throughout the film she attempts to keep Scarlett on the right track, serving as her guide, conscience, and mother-figure, though she is often ignored. Prissy is the adorable but whining, hysterical house girl who enrages Scarlett with the lie that she knows how to deliver babies when Melanie goes into labor during the battle of Atlanta. After Scarlett returns to the house after an unsuccessful attempt to fetch a doctor, Prissy's confession that "I don't know nothin' about birthin' no babies!" reveals her as a liar and earns her a sound slap in the face from Scarlett. Porky the house slave is good hearted but slow. When Scarlett returns home with a captive cow, he protests, "Whose g'wine to milk that cow? We's house slaves!" The book was written in 1936, barely 75 years after the end of the civil war. Perhaps we were not yet ready to admit the cruel and inhumane ways that the slaves were treated by the Southern plantation owners. There may have been a few who were treated kindly, but even those were still human beings held captive in servitude against their will. Most had lives of indescribable suffering. But in 1936 it may have been easier to look back through a set of rose-colored glasses, and infer that their lives were happy and peaceful. After all they were just slow dimwitted children who needed someone to look after them. I still love the move - the romance, the pageantry all played out against the backdrop of one of the greatest dramas of American history. But as for the inaccurate portrayal of the blacks of the era, newer films like "Twelve Years a Slave" tell the true horrific story. 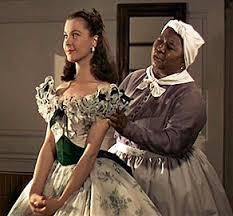 As for "Gone With the Wind"''s sugar coating of slavery - I'm glad it's gone with the wind and hope it does not return.